We are introduced to Cass and Max-Ernest come to the local museum for their Egypt project. Things start normally enough as they gather information for their history project. Adventure and mishaps quickly follow. They are wrongly accused for breaking something, and work to clear their name, all while trying to find the Secret at the same time. Cass is a confident, clever, and sarcastic girl. She is also a member of a secret society with her two closest friends, Max Ernest and Yo-Yogi. Their mission is to save the world; from what, they don’t know. Max-Ernest, is a brainiac who almost always has a plan. He is usually the one to get Cass out of trouble.Yo-Yogi, on the other hand, is an unintelligent boy who is very interested in rock music. He is a violinist and hates it; Yo-Yogi cares much more about guitar than any instrument. All care very greatly for each other. 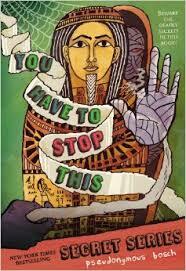 ¨You Have To Stop This¨ is a very exciting and suspenseful book. First the duffle bag that could have the answer to the Secret disappears at Cass’s grandfather’s yard sale, and then they damage an ancient artifact at a museum. There is always something interesting happening on every page. I personally loved this book. Anyone who loves mystery and suspense will fall in love with it. I would recommend it to teens who love mystery and excitement. I love the way Bosch writes. If he thinks he needs to, he will have a break from the story and dedicate a whole chapter to talking to the reader as the narrator to explain bits of the book that you might have missed or forgotten about. Bosch makes every page count, every scene seems like a major part of the story that is so intriguing it makes you want to keep on reading. When he talks to the reader, he uses his sarcastic wit in such a way I found myself laughing out loud. Bosch just wants to make you keep on reading and never stop. All in all, Pseudonymous Bosch is an excellent writer with a very mysterious genre of books.